Today’s Magazine Monday is slightly different compared to my usual Magazine Monday. Today Ill be sharing some fashion and beauty news that some of you lovies might be interested in. News is usually found in mags too, right? Right! First up. I have quite a big international reader following on my blog and I do hope my next bit of information will encourage them and even local readers to definitely check it out when they traveling to the UK. Sorbet will be opening its first Sorbet Salon in Muswell Hill, London in July 2015. I’m a huge Sorbet fan and I know you’re guaranteed some kickass service and leave feeling rejuvenated. Dermalogica and Environ products will be the flagship products used and sold in the salon. A little birdie told me that the next international step will most likely be … Dubai! Ps. With the styler you get all of the other extra goodies like the hairclips and the paddle brush. I’m an avid expo goer and I’m an even bigger Factory Shop Expo goer because I love me some bargains. I attended the Factory shop expo for the past two years, if you want to read my thoughts just click for my 2013 post and click for my 2014 post. What I love about the FSE is that are so many goodies under one roof. You can shop till you drop at affordable prices, there’s some live entertainment and some yummy stands that you can purchase coffee or whatever. The Factory Shop Expo will be from 25 to 26 July and the tickets prices will be retailing for R40. This next one is a must. I’m trying to save moola like crazy because I need.want.must attend MBFWCT. I couldn’t attend it for the past few years because it was always in Ramadan but this year its not. Fashion week is from July 30 to August 1. You can purchase your tickets from Webtickets. Then I have some release dates for all of you beauty/makeup lovers that’s been waiting for the return of Benefit Cosmetics for the past few years. I’m pretty sure that all of you know that the brand will be returning to South African shores and I have the dates. 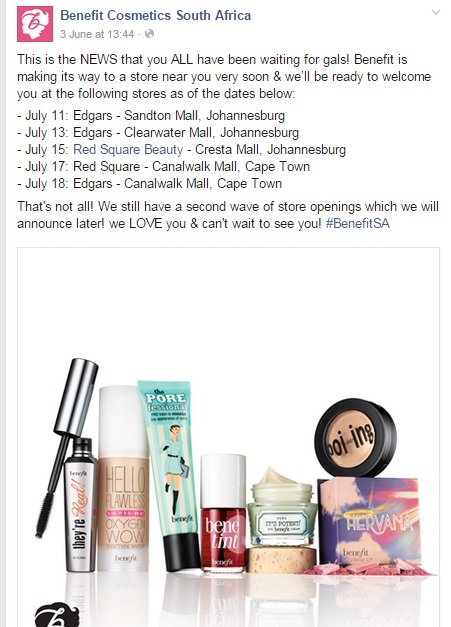 Benefit also promises to expand their retail locations to more Edgars’s across the country so definitely keep your eyes on their Facebook page for location releases. Last on my list I just threw this one in for good measure. I love Mr Price and every year their winter range just seem to get better. I love what’s currently in store and on their online store. If you’re like me and totes broke then you should enter this comp. Click on the image below and it’ll take you to the entry form. 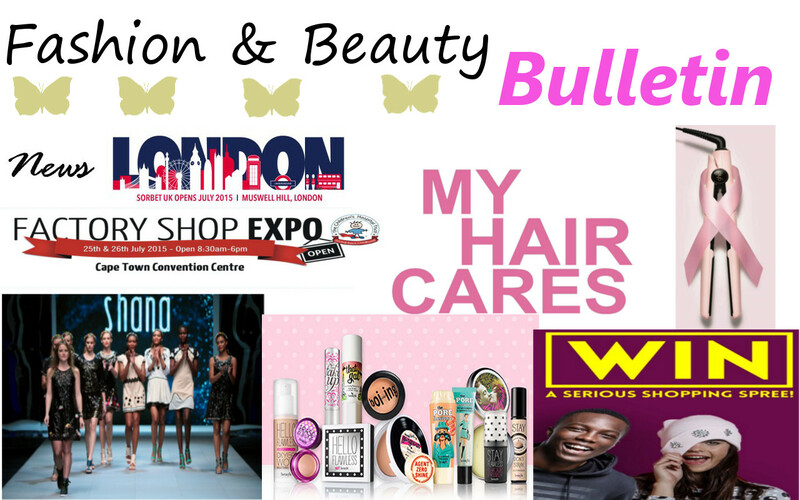 Tags: Accessories, Bath and Body, Beautiful Skin, Beauty, Beauty Banter, Beauty Blogger, Beauty Brands, Beauty Budget, Beauty Products, Benefit Cosmetics, Blogger, Breast cancer awareness, Cape Town, Edgars, Expo, Facebook, Factory Shop Expo, Fashion, Fashion Week, GHD, London, Make-Up, MBFWCT, Mr Price, Online Shopping, Pink, Pink Drive, Sorbet, Trends, UK. Bookmark the permalink. IKR? I’d give my front teeth for that styler. It’s perfection! I can’t really choose between this one format of Magazine Mondays or your usual, both are great. This was super informative though. I read your 2014 post about the Factory Shop Expo and it sounds amazing! Any idea where I can buy tickets for this year? The only expos I usually attend are pre-Ramadaan and pre-Eid ones. You can find everything you need under one roof. Hehe Thanks for reading, you’re a darling! I love the feedback. You can buy tickets online at webtickets or you can buy it at the expo but the ticket queues are usually a bit long. P.s if you do decide to go, go on the 1st day because you’ll find all the good stuff on the 1st day.